When the gadget that you really want to play with right now starts to run out of battery power, you will likely be forced to change positions to charge the device while you use it. It’s a first world problem to be sure, but someone figured out a way to beat it. 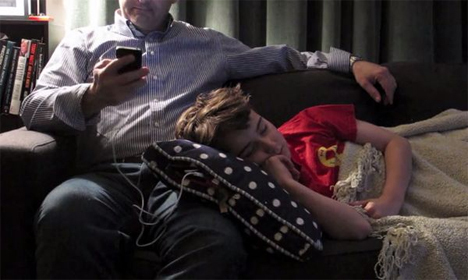 The Power Pillow is a throw pillow with a battery inside which charges your device while you lounge on it. Created by Lisa Sutt and Geoff Martin, the Power Pillow takes a lightweight 12,000mAh rechargeable battery and sticks it into a soft pocket just inside the pillow’s zipper. A micro USB cable plugs into the battery and then, presumably, the other end is plugged into the device you wish to charge. The battery can charge an iPhone five times or an iPad one and a half times before needing a recharge, according to the designer. And if you really need to charge something on the go but don’t want to lug around a pillow, the battery is removable and small enough to fit in a pocket. The Power Pillow comes with two batteries so you’re never left with a dead battery in your gadget and your charging pillow at once. The pillow comes in seven different designs to match your decor. Not only will this product let you play with your electronics instead of leaving them lonely and trapped at an outlet; it’s perfect for travel or when you aren’t sure you’ll be anywhere near an outlet all day. 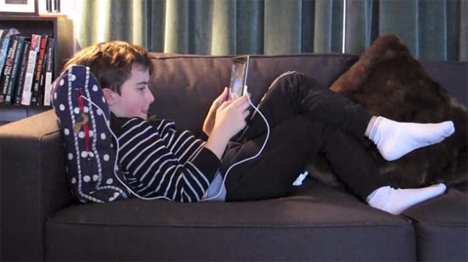 The Power Pillow’s successful Kickstarter campaign means that these fluffy chargers will soon be helping kids veg on the couch with an iPad all day. See more in Phones & Mobile or under Gadgets. February, 2014.